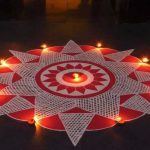 Home→Use your designs→Spirograph Rangoli Designs for Diwali? 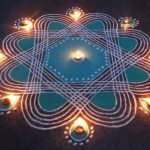 Spirograph Rangoli Designs for Diwali? 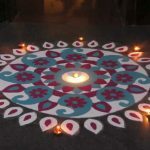 A Spirograph fan in India, Dhaval Shah, sent me some pictures of rangoli patterns. 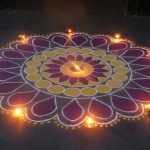 These are designs made on the floor to welcome guests during festivals such as Diwali, the Hindu festival of lights, which starts in a week on October 30th this year (2016). Dhaval noted that Spirograph (or Wild Gears) would be a great tool for creating rangoli patterns. Looking at the examples below, don’t you agree? 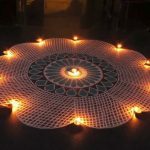 If anyone makes a Spirograph rangoli, please take a picture and share it with us! Read more about rangoli here [Wikipedia]. Dhaval’s Art Blog is here. Thanks heather mam. Its A pleasure for me that u considered making a post from my diwali wishes.